I don’t care how many free abandoned puppies you may get from running marathons, I’m just not doing one. I can barely run for a bus, so sod another 26 miles. Not interested. Especially if it means carrying a dog at the same time. I don’t care how cute the dog is. Oh, okay, that dude looks pretty sweet. Maybe you can talk me round. One person who didn’t need persuading was Khemjira Klongsanun. 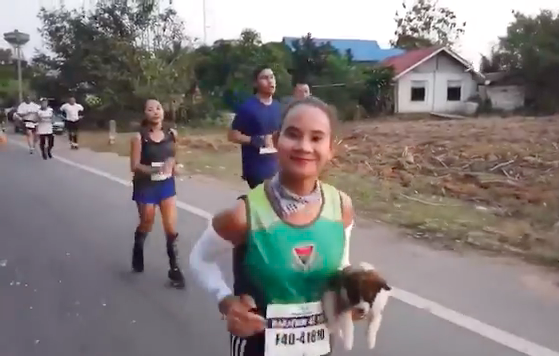 Seven miles deep into a marathon in Ratchaburi, western Thailand, last Sunday (January 27), Khemjira noticed her fellow runners moving out of the way of the lonely pupper. Acting like a good sport personified, Khemjira, 43, slowed down to see if she could see the doggo’s owner, as her competitors raced past. She quickly realised there was no one beside the road cheering on the race, nor any houses nearby, leading her to the conclusion the little bangkaew (Thai wolf dog) must either have been lost or a stray. Khemjira picked up the pupper and carried him all the way to the finish line 19 miles away. What a champ! The shop owner has now adopted the puppy, believed to be just a few months old, and named him ‘Chombeung’ after the name of the marathon. It seemed to me that this little guy was lost. There were no houses, no other dogs, or no people around. So, I picked up the puppy, if only to take him out of the unsafe environment. 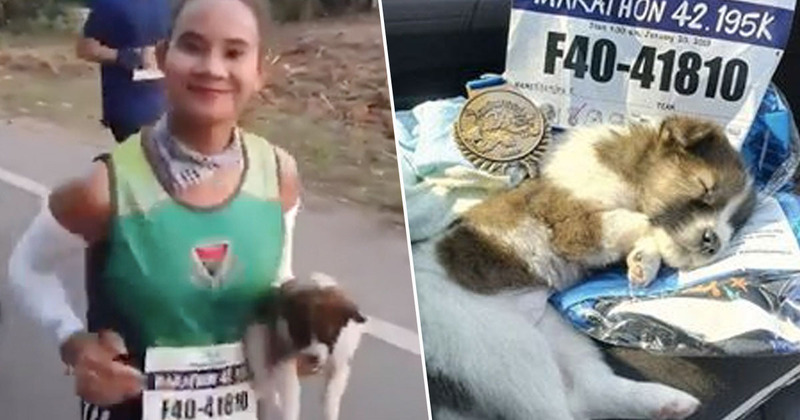 Chombeung isn’t the first dog to take part in a marathon. Back in January 2016, two-and-a-half-year-old bloodhound Ludivine took place in a half marathon in Alabama and came seventh. Ludivine sneaked out of the back garden and made her way to the starting line of the race. She then ran the entire 13 mile course, finishing in an impressive one hour and thirty minutes. Her owner April only found out about her Ludivine’s exploits when race volunteers starting texting her pictures of the pup wearing her medal. My first reaction was that I was embarrassed and worried that she had possibly gotten in the way of the other runners. I can’t believe she ran the whole half marathon because she’s actually really lazy. Nice work Chombeung and Ludivine, you’re doing excellent work at putting all us humans to shame.